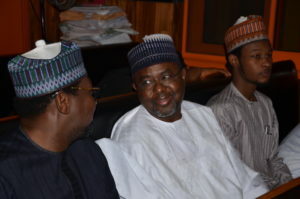 The Independent Corrupt Practices and Other Related Offences Commission (ICPC) has asked the court to overrule a No-Case Submission filed by the suspended Director-General of the Securities and Exchange Commission (SEC), Dr. Mounir Gwarzo and former Executive Commissioner (SEC) Zakawanu Garuba. In an amended charge filed before Justice Hussaini Baba Yusuf of the Federal Capital Territory High Court 4, sitting in Maitama, Abuja, the prosecuting counsel, Raheem Adesina, asked the defendants to explain the issue of severance package benefits that were paid to Gwarzo. Thereafter the counsel to the defendants Abdulhakeem A. Mustapha (SAN) and Robert Emupkoeruo, adopted their written addresses before asking the court to uphold the No-Case Submission and discharge the defendants. Part of the charge reads; “That you Dr. Mounir Haliru Gwarzo (M) between May and June 2015 or thereabouts at Abuja within the jurisdiction of this honourable court, during the period of your appointment as the Director-General of the Security and Exchange Commission (SEC), being entrusted with the management of SEC did commit criminal breach of trust to wit: dishonestly misappropriating the sum of N104,851,154.94 (One Hundred and Four Million, Eight Hundred and Fifty One Thousand ,One Hundred and fifty four Naira and Ninety Four Kobo), as your severance package which you were not entitled to, and you thereby committed an offence contrary to Section 311 and punishable under 312 of the Penal Code Act Cap 532 volume 4 Laws of the Federal Capital Territory Abuja, 2007”. “That you Zakawany Garuba (M) on or about June 2015 or thereabouts at Abuja within the jurisdiction of this honourable court, while being a public officer as a Commissioner in the Securities and Exchange Commission (SEC) used your position to confer a corrupt advantage upon another public officer to wit: approving the sum of N104,851,154.94( One Hundred and Four million, Eight Hundred and Fifty-One Thousand, One Hundred and Fifty-Four Naira Ninety-Four Kobo) as severance package to the then Director-General of SEC; Dr. Mounir Haliru Gwarzo which he was not entitled to and you thereby committed an offence contrary to and punishable under 19 of the Corrupt Practices and Other Related Offences Act 2000”. The judge adjourned the ruling to 12th April, 2019, adding that the defendants’ bail should continue.